Serves 4-6. Preparation time 5 minutes. Cooking time 20 minutes. • Grind the black pepper into a hot pan, add the butter and fry the onion for a few minutes. • Add the garlic, wine, stock, oysters and peas, and simmer. Stir in the seafood and sour cream. 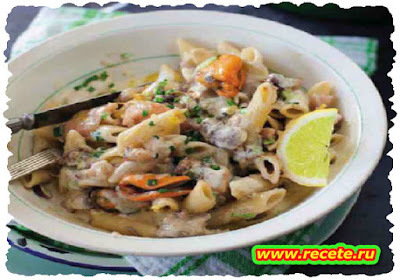 • Cook the pasta, drain but keep a few spoons of the water to stir into the creamy sauce with the pasta. Sprinkle with parsley and lemon (zest and juice).